One of the earliest recognized business litigation matters, or business torts, was corporate or business fraud or misrepresentation. 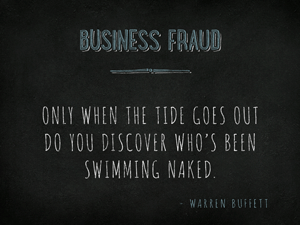 Business fraud can effect almost anyone—a business, an owner or an individual consumer. Business fraud can be business-to-business fraud, business-to-consumer fraud and consumer-to-consumer fraud. In corporate fraud cases, a number of factors must be considered, including the specific details and nature of the business fraud or misrepresentation and the relationship of the parties involved. These factors, among others, will affect the analysis of the above legal elements. Other legal elements, such as reliance on the business fraud or misrepresentation and whether there was a specific intent to defraud, may also affect the analysis of the case. Our Chicago business dispute attorneys are experienced and knowledgeable and are well equipped to provide counsel regarding business fraud. A business fraud claim, in addition to the other elements, requires specific intent by the defendant. In other words, in addition to proving the act was performed, the plaintiff must also prove that the defendant did so with the intent to defraud. This can be difficult for any experienced business litigator to prove, but with full and proper discovery and examination of witnesses, the fraud can be uncovered. What is necessary for misrepresentation in a business fraud claim? For misrepresentation, the substance of the representation or statement must be material to the recipient’s choice of conduct in the business transaction in question. Generally, a representation or statement is material whenever: (1) A reasonable person would attach importance to its existence or non-existence in determining his or her choice of action in the business transaction in question; or (2) The person making the representation or statement knows, or has reason to know, that its recipient regards, or is likely to regard, the business matter important in determining his or her choice of action, even if a reasonable person would not so regard it. At the heart of the business fraud claim is misrepresentation –an intentionally false assertion that misleads others to rely on such false representation. Generally speaking, the fundamental requirement is that the misrepresentation is knowingly false. The misrepresentation may be a verbal statement, it could be written, it could be an active gesture, or a knowing concealment of materially true and significant facts. Further, ambiguous and incomplete representations that are false and misleading qualify as misrepresentations, even if the misrepresentation was made negligently or with the knowledge that the recipient might be misled by the false statement. For example, a prospective seller of an Illinois business may be liable for business fraud, possibly through a breach of contract issue, if he or she discloses financial records of the business that place the profitability of the business in a positive light, but fails to provide other records that are capable of a different interpretation. However, failure to disclose important facts, such as the seller’s financial records, which are subject to ordinary inspection and inquiry, or about which there is not expectation of disclosure, either because of the arm’s length business transaction or the absence of any communications between the parties, may not support an action for business fraud or misrepresentation. The intention of inducing reliance on the business fraud or misrepresentation is the key to the scope of the liability for the fraud. The person making the representation or statement knows, or has reason to know, that its recipient regards, or is likely to regard, the business matter important in determining his or her choice of action, even if a reasonable person would not so regard it. In addition to common law claims for fraud, Illinois has enacted statutes to protect against fraudulent and/or deceptive business practices that can cause serious and irreparable harm to businesses and individual consumers. One such statute is the Illinois Consumer Fraud and Deceptive Practices Act (815 ILCS 505/1 et seq.). The Illinois Consumer Fraud Act allows damages from conducting trade or commerce, for: fraud, deception, false pretense, false promise, misrepresentation or concealment of facts. The elements of a claim under the Illinois Consumer Fraud Act include (1) a deceptive act or practice by defendant; (2) defendant intended that plaintiff rely on the deception; (3) deception occurred in the course of trade or commerce and (4) deception caused damage to plaintiff. Examples of deceptive trade practices include: misrepresenting the source, certification or quantities of a good or service; misrepresenting that goods are new when they in fact are not; misrepresenting that unnecessary services/goods and/or repairs are needed; counterfeit goods or services; misrepresenting that goods are of a particular quality or standard; advertising with intent not to sell as advertised; among others. Business fraud cases can be tricky to both plead and defend. Our Chicago business dispute lawyers will advise you with respect to your business fraud case. Whether you are a plaintiff that has been damaged by business fraud or a defendant that is being sued for business fraud, contact our Chicago litigation attorneys for a consultation regarding your rights. Our Chicago business fraud attorneys handle cases in state and federal courts throughout Illinois, including Cook, DuPage, Kane and Will Counties. Please feel free to contact one of our Chicago commercial litigators at 312-789-5676 or email our Chicago law office to inquire about your business fraud case. Philadelphia's "rainbow wave" in this year's municipal elections is one reason that LGBTQ advocates are excited about municipal races across the country this year. The Washington, D.C.-based LGBTQ Victory Fund's...Photo Credit: NBC10 Illustration This story uses functionality that may not work in our app. Click here to open the story in your web browser.